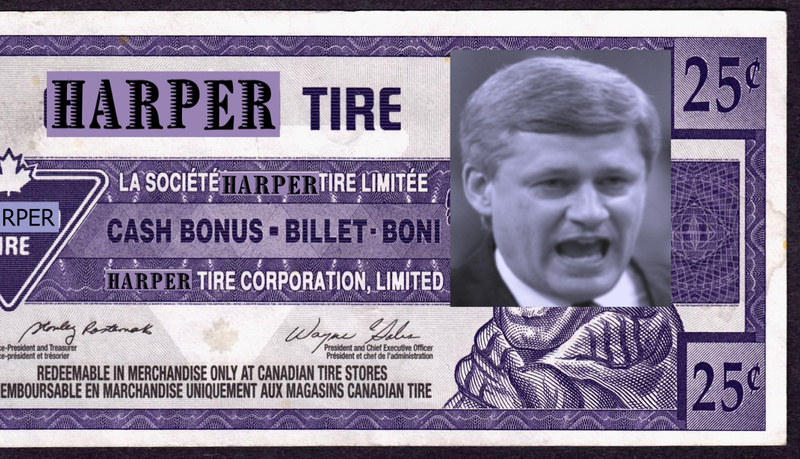 So the Harperites have deemed it proper to once again “re-brand” something… this time, the nation’s name. Yup, no longer is the government of the land to be referred to as, well, the government of “Canada”, but rather as “The Harper Government” (insert threatening music here). But I for one welcome this news! I see this as a major step forward for honest and open government! Gone are the days where the ReformCons masqueraded as the Government of Canada, because, face it – they have never actually represented the majority of those of us north of the 49th. 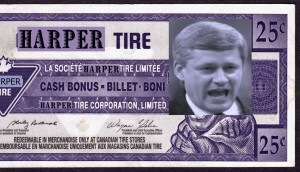 Harper Tire: the new money has a different image of Dear Leader for every denomination ! The Royal Bank of Harper: just returning the favours done for the banks over the past 5 years. Harper’s Football League- maybe he will write a book about our sport now! James Travers passed away yesterday. Look, we bloggers are nothing more than rank amateurs who stoop to (in the words of a journalist friend) give words away for free. Mr. Travers was a man whose work was worth it’s weight in gold. I’ll miss his columns and send out my condolences to his family, friends and colleagues. The forum, entitled The future of public and non-profit childcare in Ottawa was lead by a panel representing some key players in our childcare network. One of the panelists was former OCDSB Chair, Cathy Curry. Theresa Kavanagh was also in the crowd of about 200ish attendees. It is good to see public board Trustees engaging in this conversation. But what is really needed right now is leadership at the City level and a better coordinated strategy among the parents who serve on Boards of Directors. As early learning kicks into full gear in this province, there are going to have to be some innovative thinkers taking the helm. OC Transpo was crawling along through the downtown on Monday at a pace that was slow even for them. A few Tweets when hither and yon and it turns out that the delay was due to downtown garbage pick-up. Is there not a way that the City, OC Transpo and the firms contracted to do the downtown commercial garbage collection can work together so that pick up can take p^lace OUTSIDE the rush hours periods? It cannot be THAT tough to coordinate this, can it? The Conservatives have been in defensive mode since last week, when it was revealed that four senior members of the party, including two senators who sit in caucus, were charged by Elections Canada in connection with allegations that the Tories broke their advertising spending limits in the 2006 election. Immigration Minister Jason Kenney has apologized following revelations Thursday that his office used government resources to raise money for the Conservative party. The allegations were raised by the New Democrats after they obtained a letter, sent Thursday by Kenney’s office on parliamentary letterhead, that was seeking $200,000 in donations to support a Tory strategy targeting “very ethnic” ridings. James Kenney!!! – this couldn’t happen to a nicer guy. And he should resign. But he won’t. The ReformCons are once again declaring themselves above the law!